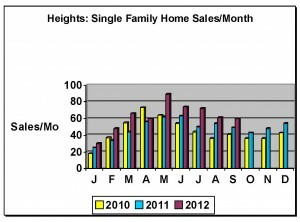 Home sales in the Heights have been booming for several months now. The cute, clean, nicely updated homes sell quickly. If it’s beautifully redone and you love it, you’d better make an offer quickly. I have several clients who look at homes the first day they come on market. They have very specific wants and know it will sell quickly. It adds a level of stress to the home-buying process…get there quick and make an offer. Now that it’s getting to be Fall, sales are slowing. It’s not so frantic. Last month’s headline was: Houston home sales reach greatest volume in five years. The latest news release from HAR (Houston Association of Realtors) tell of a continuing strong market but a seasonal tapering of sales. New-home sales are strong. So, it’s a little more rational now. 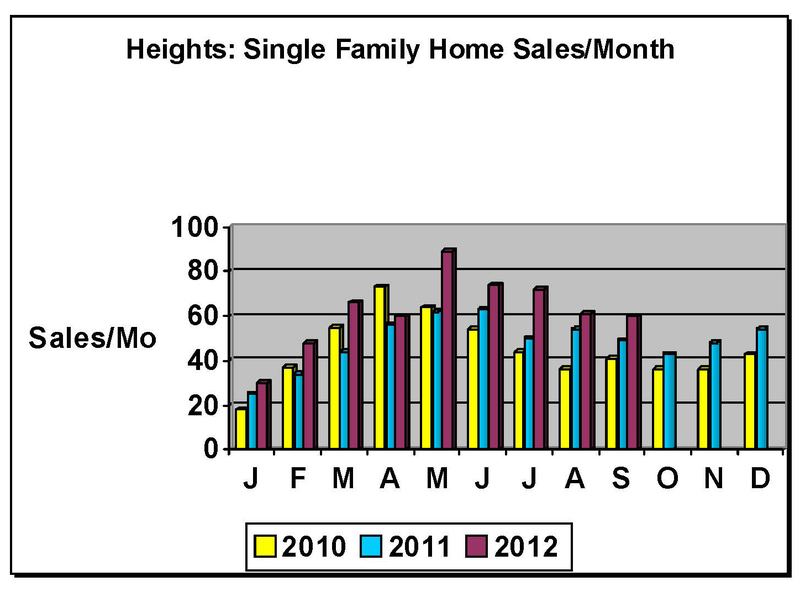 The chart below shows Heights home sales of single-family homes. The last few months have been 30-40% higher than the previous year. New home sales remain very strong. There still aren’t as many homes being built as pre-recession, but they sell quickly. The limiting factor in building homes a year ago was lending. Builders had a tough time getting loans on spec houses. The limiting factor now is finding Heights land at a reasonable price. Decent, affordable lots are difficult to find. Some asking prices are ridiculous. New homes range from $249K for ANC’s garage-front homes on W 19th St, to homes in the $800K’s by HDT, Mazzarino, Lucia’s Oaks. I will do a post on these high-end homes soon.